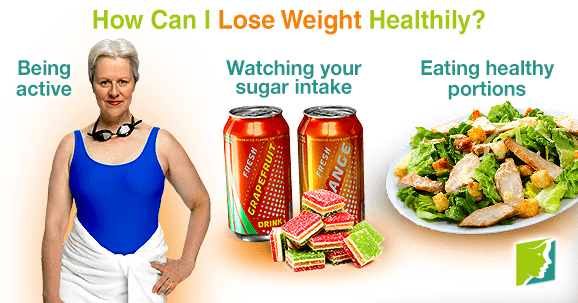 Losing weight is a serious struggle for many women. Since weight gain is common during menopause and metabolism generally slows down with age, weight management can be more difficult. Unfortunately, this causes many women to waste their money on diet pills, weight loss books that falsely promise instant results, and even surgery. The most important aspect of weight loss is your mindset and keeping a positive attitude. Losing weight and keeping it off is a matter of lifestyle changes that will make you happier and more active. While exercise is generally associated with spending hours at the gym or struggling through a long and difficult aerobics class, simply being active is what matters when it comes to a healthy lifestyle. Losing weight is simply a matter of getting on your feet and moving regularly throughout the day. This can be housework, gardening, dancing, walking instead of driving, and swimming, among other activities. People tend to get stuck in a sedentary lifestyle pattern where sitting or lying down is a common action. Develop a lifestyle where you always looking for ways to stay on your feet. Excessive sugar intake is a major cause for weight gain among individuals. This is because sugary substances - whether sweet drinks, desserts, chocolate, or candy - are empty calories. This often causes excessive consumption and you don't realize how much it has built up until you notice a bit of a bulge around your stomach or thigh area. If you are craving sweets, try eating fruit. Whole, raw fruits are full of vitamins and nutrients, and you will learn to appreciate them more as you cut processed sugars from your diet. Healthy eating isn't only a matter of what you eat, but how much. Everything in moderation is a popular phrase for a good reason. As portions at many restaurants and fast food spots become larger, people are losing sight of proper serving sizes. Be in touch with your body and eat until you are satisfied, but not bursting. When dining at large-portion restaurants, a good rule is to get half your meal wrapped to go before you even begin to eat. You should try to steer clear of processed foods, fatty foods, and dark meats. Instead enjoy vegetables, whole grains, and lean proteins, such as tofu. There are a lot of traps out there when it comes to leading a healthy lifestyle. The way society is set up makes it very easy to get carried away with lavish meals and sedentary activities. However, when you are in touch with your body, feed it well, and keep moving, you will feel better and ultimately look better, too.